Hendrik is a Staff Scientist in the X-ray Laboratory for Advanced Materials (XLAM) at the Stanford Synchrotron Radiation Laboratory, USA. In his research, he is studying exchange coupling phenomena between antiferromagnetic and ferromagnetic materials using polarization dependent x-ray absorption spectromicroscopy. 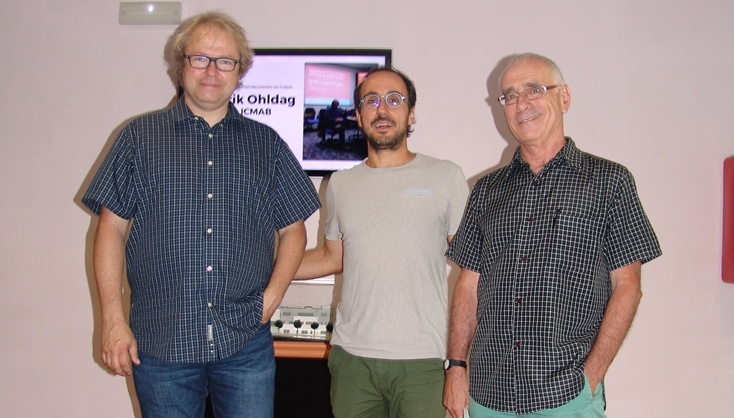 He was hosted by Ferran Macià, researcher at the MULFOX group working within the multifunctional oxides group. His work experience and interests are magnetism and spintronics in mesoscopic systems. He is currently exploiting the magnetic and electric signals at the nanoscale to approach device miniaturization. Both Hendrik and Ferran believe that scientists should connect their work with society. In fact, one of the objectives of the IEEE Magnetics Society Distinguished Lecturer is to disseminate progress and advances in the field of magnetism and to involve the international scientific community in its broadest sense. The program supports the different associated chapters of the society by making available lecturers who can inspire and encourage new researchers, particularly the younger ones, to start an activity and a professional career in magnetism. At ICMAB, the audience enjoyed the talk and commented that it covered a wide range of very interesting topics. Our institute is always welcome and open to scientists from other institutes and from abroad, and eager to learn and collaborate together. Take a look at hendrik's Ohldag Curriculum Vitae for a complete list of publications.